was a Brooklyn born graffiti artist, turned iconic painter of the neo-expressionist movement. JMB was only 27 years old when his untimely death came in August of 1988. Born of a Haitian father and Puerto Rican mother, JMB was intrigued by art at a very young age. His mother would take him to museums and exhibits and would then enroll him as a junior member of the Brooklyn Museum of Art. As a kid, JMB was fluent in French, Spanish and English. While attending Saint Ann’s (an art based private school) he wrote children’s book that were illustrated by a friend. As an adult, JMB joined artistic forces with Al Diaz and together they created what is now famously known as “SAMO!” Samo was a play on the term “same old” and the duo were relentless in their pursuit of writing and creating murals all over Manhattan, which eventually spread “Samo” far and wide from their early hot spots of NOHO and SOHO. It was in the early 80’s that JMB started to really make a name for himself in the art world. 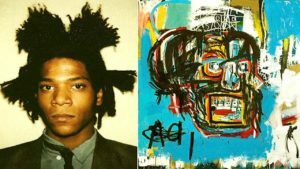 After participating in a number of exhibitions as well as bouncing around to various studios in Italy and the California coast, JMB started to spend a lot of his time living and working beside Larry Gagosian and put on shows at the Gagosian Gallery. At that same time, JMB would have his girlfriend living with him and helping with exhibitions – the then unknown, aspiring singer, Madonna. JMB often collaborated with musicians such as David Bowie and others from around the world and by the mid eighties was known for his unique style and taste. He often collaborated with other iconic artists like Andy Warhol and Keith Haring – who you read about in our last segment of Artists Corner. JMB was a man of many distinct and eccentric methods and styles. He often wore very expensive Armani designer suits to paint in the studio and would then wear the paint splattered suits to important events! In JMB’s final years, like many others with similar circumstances, struggled with drug addiction. His growing opiate usage and addiction started interfering and deteriorating many of his personal relationships and took a toll on his responsibilities. Despite multiple attempts to address his substance abuse issues and a stint of working towards full sobriety in a reclusive trip to Hawaii, JMB was unable to turn things around for the better. At the age of 27, JMB died in 1988 of a heroin overdose in his art studio on Great Jones street in NOHO neighborhood in Manhattan. In his short 27 years on earth, JMB went from being unemployed and homeless to selling single works of art for figures upwards of $25,000 in the 80’s. He solidified himself as one of the most iconic and praised artistic minds of contemporary art culture. On May 18, 2017 during a Sotheby’s auction, one of JMB’s “untitled” skull paintings created with oil sticks and spray paint set a new record high for any US artist, selling for $110,500,000!! !